Democrats will get what they wished for this week when the Senate takes up the issue of young, undocumented immigrants who were brought to the country illegally as children. 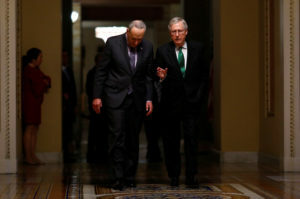 But in pushing Senate Majority Leader Mitch McConnell to agree to an open-ended floor debate, which gives senators a virtual blank check to introduce a broad range of immigration proposals, Democrats risk stirring up long-running fights over immigration policies that go beyond DACA, the Deferred Action for Childhood program at the center of the recent budget battles on Capitol Hill. To many immigration reform advocates watching from the sidelines, the process will underscore how the Democrats’ all-or-nothing fight for so-called “Dreamers” has overshadowed the party’s ultimate goal of passing comprehensive immigration reform that grants a pathway to citizenship to the nation’s overall population of roughly 11 million illegal immigrants. This isn’t the first time the DACA issue has seemingly eclipsed other debates on immigration policy. “I think it’s hard to criticize the [Democrats’] current strategy because we’re talking about real people and their lives,” said Maria Echaveste, a senior scholar at the University of California, Berkeley’s Center for Latin American Studies. Still, “there may be second thoughts in some quarters about placing Dreamers front and center” in the immigration debate, said Echaveste, who served as a deputy chief of staff to President Bill Clinton. This isn’t the first time the DACA issue has seemingly eclipsed other debates on immigration policy. Congress has made several unsuccessful attempts since 2001 to pass legislation protecting Dreamers, and often the ensuing fights left no room for other immigration policy debates, said Mark Hugo Lopez, the director of Hispanic research at the Pew Research Center. Even among Democrats, the current fight over DACA hasn’t gone smoothly. The tension on the left was evident last week after House Minority Leader Nancy Pelosi gave a record-long, eight-hour speech in support of DACA on the House floor. Two days later, Pelosi voted against the budget agreement, saying she could not support a deal that does not include protections for Dreamers. But in a rare break with leadership, 73 House Democrats crossed party lines to support the bill, which raised spending caps and included funding for health care, opioid abuse treatment, and disaster relief, among other measures. The vote drew a sharp rebuke from liberal Democrats, who have faced increased pressure from the party’s progressive base to act on the issue after President Donald Trump rescinded DACA last year. The program, which was created through executive action by former President Barack Obama, will end March 5 unless Congress passes a law to replace it. Yatziri Tovar, a DACA recipient who works for the immigration advocacy group Make the Road New York, said Pelosi’s speech would have mattered more if it produced results. “The efforts of Nancy Pelosi speaking out are great, but I wish she put a little bit more pressure on Democrats” to block a budget deal that didn’t address DACA, Tovar said. Pelosi’s allies defended her focus on DACA, arguing that it made sense given the approaching deadline and the unlikelihood of passing broader immigration reform while Republicans control Congress and Trump is president. 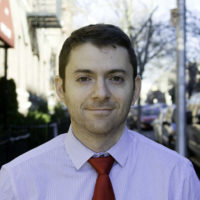 “We’re staring at a very quick March deadline on this, and it has obviously a tremendous amount of urgency behind it,” Drew Hammill, Pelosi’s deputy chief of staff, said in an interview. Hammill added that talks on comprehensive immigration reform would never get off the ground so long as any proposals put forward by Republicans reflected the views of hardline immigration opponents like White House senior adviser Stephen Miller and Sen. Tom Cotton, R-Ark. “If a Republican effort to pass immigration reform is crafted by Stephen Miller with the hope of getting Tom Cotton’s vote, it’s never going to happen. That’s not how you get anything bipartisan done in this town,” Hammill said. As the focus shifts to the Senate this week, Senate Minority Leader Chuck Schumer will face even greater pressure from the left to strike a DACA deal in the Senate that could also pass the House. Unlike McConnell, House Speaker Paul Ryan has refused to promise to hold a vote on a bill to protect Dreamers. Schumer has been criticized by immigration groups and members of his own caucus for failing to secure a DACA fix in the last few rounds of budget negotiations. In response to a request for comment, an aide to Schumer said the minority leader was focused on finding a solution for DACA before the program ends next month. But the past few weeks of budget talks may have left Schumer in a weaker negotiating position as he enters a critical period of negotiations. Having already staged a government shutdown last month, Senate Democrats will have a harder time opposing the immigration deal Trump proposed before his State of the Union speech earlier this month. That plan offered a pathway to citizenship for 1.8 million young undocumented immigrants, in return for stricter border security and immigration enforcement, funding for a border wall with Mexico, and changes to the visa lottery and family-based immigration systems that would significantly limit legal migration to the U.S.
Trump called the plan a “down the middle” compromise in his State of the Union address. Many Democrats complained that it included nearly all of his top anti-immigration policies, in exchange for a single concession on DACA. Immigration opponents said that protecting DACA recipients was a generous offer on Trump’s behalf, one that would surely anger his base. “President Trump put out an extremely generous proposal that honestly amounts to a betrayal of a key campaign promise,” said RJ Hauman, the top lobbyist for the Federation for American Immigration Reform, a conservative think tank. “Trump didn’t run on DACA amnesty,” Hauman said. Andrew Arthur, a fellow at the conservative Center for Immigration Studies, said Schumer would be wise to accept Trump’s immigration proposal, as they likely won’t get a better offer. 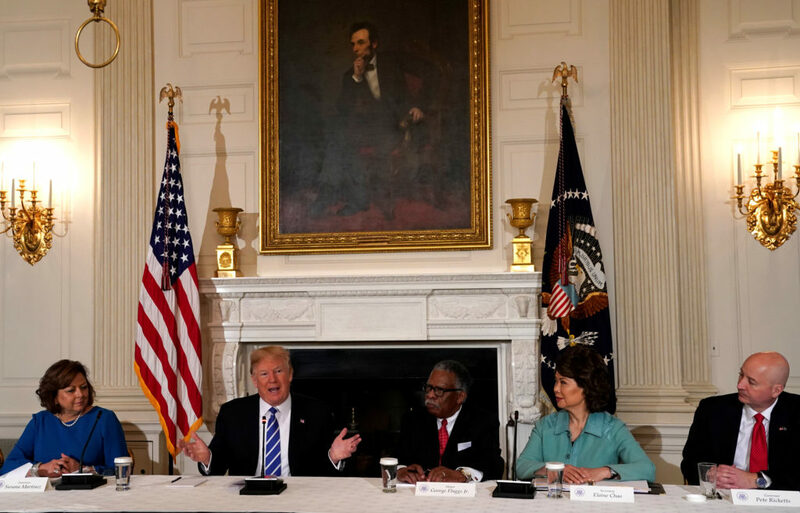 A group of Senate Republicans introduced legislation Sunday that incorporates many of Trump’s ideas, a sign that the party plans to use the White House proposal as the basis for starting negotiations this week. “I’m not 100 percent sure why they haven’t accepted the proposals the president made. I think part of it is a political strategy, the idea being we don’t want to actually resolve the issue but we want to have it as an issue in the midterm elections,” Arthur said. Correction: An earlier version of this story incorrectly spelled RJ Hauman’s name.